In May 1918, Lance-Corporal Talbot Mohan and his comrades were resting in a supposedly quiet sector of the Western Front when the Germans launched the third phase of their Spring Offensive. Mohan’s unpublished war diary offers us a unique eyewitness account of the chaos of the subsequent Allied retreat. The German Spring Offensive of March 1918 had made extensive gains along the Somme River region. But by the first week of April, their advance had started to run out of steam and they were held east of Amiens. Next, the Germans shifted their attention north to Flanders, with another offensive south of Ypres. Operation Georgette captured the Messines ridge and much of the Passchendaele salient, but the attack lost momentum once again. The Germans decided now to test the French with another offensive further south – the Third Battle of the Aisne (27 May – 6 June 1918). On 27 May 1918, the Germans launched Operation Blücher-Yorck. This surprise attack aimed to secure the Chemin des Dames Ridge and win a breakthrough that would put them within striking distance of Paris. 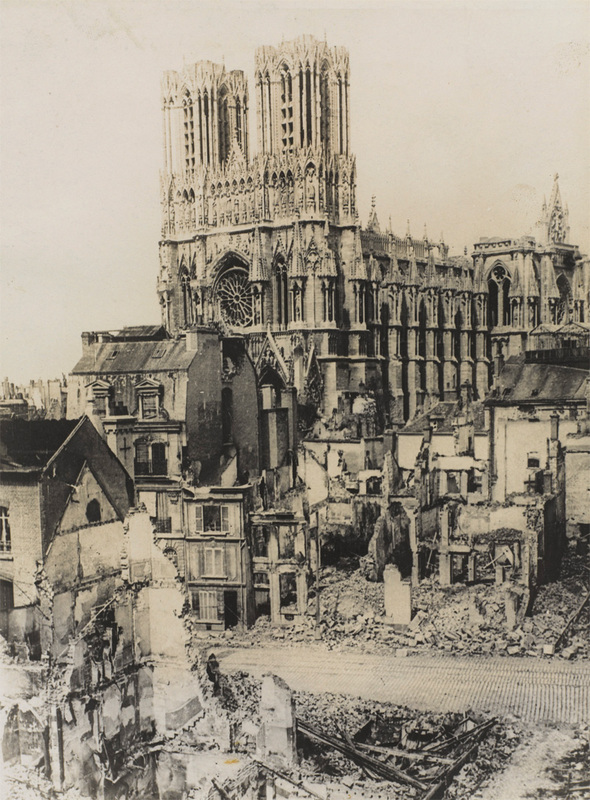 It would also force the Allies to divert troops from Flanders to help defend the French capital, allowing the Germans to renew their offensive there. At 1am, a heavy German bombardment with gas and high explosive began. The British suffered heavy losses to this barrage because the French commander, General Denis Duchene, would not abandon the ridge, which had been captured the previous year at high cost to his fellow countrymen. In defiance of instructions from his superiors, Duchene had ordered units to mass together in the front line. ‘We were entirely caught by surprise this time, and before anyone realised what was happening the Germans were back as far as our artillery. The gunners had no time to destroy their guns and as far as our division was concerned, they lost them all. We therefore had not a gun behind us – nothing to cover our retreat but machine guns. I never even saw one aeroplane of ours, though the air was alive with enemy planes. By midday, the Germans had broken through and crossed the Aisne, punching through eight Allied divisions on a line between Rheims and Soissons. The survivors of Mohan’s battalion managed to extricate themselves and began to retreat along roads filled with fleeing civilians and military traffic with the Germans in pursuit. That day, 1st Battalion marched around 19 miles (30km) in the toughest circumstances. The retreat continued the following day, but attempts were being made to stabilise the line. In the days that followed, the units of 25th Division were thrown piecemeal into action. Many were all but destroyed. Their remnants, including the 1st Wiltshire, were temporarily formed into composite units, fighting a withdrawal as the enemy pressed on. Despite the arrival of Allied reinforcements, the German advance continued and Soissons was captured on 28 May. German troops crossed the Marne and, by 30 May, they were only 37 miles (59km) from Paris. The Germans had also captured over 50,000 Allied soldiers and more than 800 guns; victory seemed imminent. But they were beset by problems, including supply shortages, troop fatigue and lack of reserves. They had also suffered over 100,000 casualties. On 6 June 1918, following several Allied counter-attacks, the Germans were finally halted and pushed back across the Marne. Soon after, Mohan’s unit was finally withdrawn for a rest. Although the Germans launched a series of smaller offensives, including one at Matz (9-12 June 1918), by July they had shot their bolt and morale began to crumble. On 18 July, the French launched a counter-attack on the Marne, forcing the Germans back. Germany’s attempt to break through had exhausted its army. The initiative passed back to the Allies. Talbot Greaves Mohan (1895-1979) was born in Torquay, Devon in November 1895. He was the son of Archibald Gault Mohan and Eleanor Johnston of Newton Abbot. Talbot had two brothers, James and Hugh Archibald, three half-brothers, Bernard Patrick, John Leslie and David Stuart, and a half-sister, Kathleen Eleanor. The 1901 and 1911 censuses show that his family lived at Tormoham in Torquay. A devout Anglican, Mohan was called up in late 1917. He trained with the 34th Training Reserve Battalion of 8th Reserve Brigade in Devon and Dorset, and was posted overseas from Folkestone on 12 April 1918 with a reinforcement draft bound for the 1st Wiltshire. Arriving at Boulogne, he travelled to Cassel via Etaples and St Omer. He was drafted into a composite battalion and spent the following days engaged in more training. The 1st Wiltshire was on the Somme front when Operation Michael was launched in March 1918, and was engaged in several days of bitter defensive fighting near Bapaume. After suffering heavy casualties, it was moved north with the rest of 25th Division to Flanders to rest and refit. It lost more men during the Battle of the Lys in April. The Flanders fighting reduced the battalion strength to only one company. Mohan’s draft eventually joined the battalion on 22 April near Poperinghe when it came out of the line. He missed the Second Battle of Kemmel (25-26 April 1918) as he was kept in reserve with a small group to form the nucleus of a new battalion should the original be destroyed, which it nearly was. His division was then moved south to the Chemin des Dames, supposedly another quiet sector, where for the next few weeks it rested and trained. But it was attacked again during the Third Battle of the Aisne. Mohan was promoted to corporal for his services on the Aisne. In July 1918, he was offered a commission, which he declined as he preferred to stay with his close friends in the ranks. He continued to serve with the 1st Wiltshire during July and August at Thiepval and then Miraumont Ridge. He was later shot in the shoulder during the British attack near Etricourt on 19 September 1918. Evacuated down the line, Mohan was eventually sent home from Calais on 23 September 1918. He spent time recovering in hospital at Berrington near Shrewsbury and at Ross-on-Wye. He was discharged from the Wiltshire Regiment on 25 February 1919. After leaving the Army, Mohan began studying for holy orders. In 1929, he was living at 45 Thornhill Road in Islington, London. He married Ada Rees at Gosport in Hampshire in 1932, but re-married in September 1947 to Kathleen Mitchell. The couple later lived in Sydney, Australia from 1956 until 1959, where Talbot was Honorary Canon of St Andrew’s Cathedral. He later lived at 18 Uplands Way in Sevenoaks, Kent, where he passed away on 10 January 1979.